Wow Orange! Wonderful……Inspirations of Color in Winter! Joni, I want to start nibbling on these petals! Yummm! And I am more than grateful for the other links you provided. I put a couple of them on my Facebook timeline and subsribed to the monthly National Geographic Photo Newletter. Super! No wonder your fabric art is so lucious! Well thanks, I also liked those links, especially the National Geographic site–hope they continue to be inspirational. Beautiful orange in that blossom! And the links are wonderful too….I love the color orange! 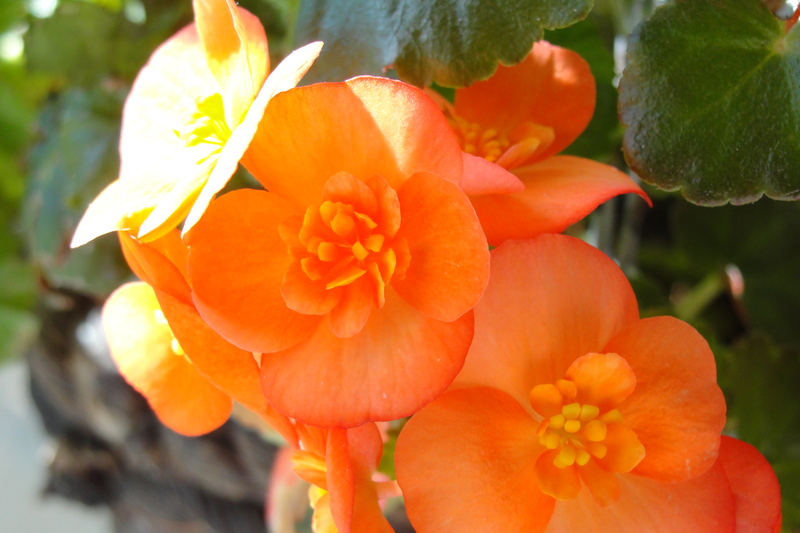 wow…it’s your flower?..Is it a begonia? It may be a begonia… this hanging plant was given to us near the end of summer. In the fall we hung it in a window indoors to try and keep it over winter…much to our surprise it began blooming profusely! Those begonias are *not* shy! What rays of light they throw!! Reminds me that spring is coming! Beautiful! not just a winter color though! I bought a summer dress this exact color and love it! You’re right & I think it’s supposed to be one of “the” colors for spring too! I just want to say I am all new to blogging and site-building and seilousry liked this web site. Probably I’m going to bookmark your website . You surely come with exceptional well written articles. Many thanks for sharing your blog.